Solar cycle update – sun’s magnetic activity still in a slump | Watts Up With That? Despite some small upticks on sunspot and 10.7cm radio activity, the magentic activity of the sun is still bumping along the bottom. A slight uptick was seen in sunspot count. A similar slight uptick occurred in radio flux. SOURCE Solar Radiation & Climate Experiment – click the pic to view at sourceMore at the WUWT Solar reference page. Maybe past the Solar Max? Interesting times. Not much of a max. “magentic activity” in a slump. When will the Fuchsic sun return?? Looks like TSI is past its peak looking at Leif’s smoothed trends. I am unable to see why it looks like a double peak; looks like just the usual 28 day cycle with changing peaks. Wrong with Hathaway’s “Solar Cycle Prediction” page is that it is continuously updated it to make the “prediction” match the past. Just a few years ago he forecast a peak of 120 sunspots for 2008. A Hathaway solar cycle prediction isn’t worth the phosphorous it is displayed on. Are we about to see the start of the second peak, which may extend the length of the solar cycle? And global temperatures continue to stagnate… maybe it’s just a coincidence? It’s too early to be sure, but right now it looks like a slight drop before the peak. On the other hand it migh be the peak, but either way, it doesn’t look like this cycle’s peak is going to be be that great. [Sigh]. When we are well into the cycle the past part of the cycle is a good predictor of the rest of the cycle, so Hathaway does the right thing: continuously updating the prediction, based on the latest data. I’m sure you would also like the weather prediction to be continuously updated based on the latest data. I am unable to see why it looks like a double peak; looks like just the usual 28 day cycle with changing peaks. What is this 28-day cycle you speak of? I found a 1997 press release from Stanford announcing the discovery of a 28.4 day cycle to solar neutrinos. Which is suspicious as the synodic lunar month (new moon to new moon) is 29.53 days, and the sidereal month is 27.32 days, average 28.4 days. Otherwise, on the quick Google search, the only 28 day solar cycle references come from a “celestial cyclic numerology” type site, and perhaps the “average” solar rotation period. What is this “usual” 28 day cycle? What is this 28-day cycle you speak of? What causes the large TSI drop off on the SORCE daily avarage graph? For those who don’t want to wait until NOAA posts the number, go to Australia’s IPS site. This is an international number and they always have it on the first of the month. Translation: We do not know how to predict solar activity. But, the “science is settled”…. What causes the large TSI drop off on the SORCE daily average graph? Basically wrong as we do. The polar fields during the years before solar minimum give a fairly good indication of the size of the next cycle. Once well into the cycle, the shape of the cycle up to that point is also a good predictor. Then, you are basically wrong. A “fairly good indication” is not a prediction. Your move, predict the next five years of solar activity. Within the range of the data presented, is there any reason to theorize that we may be about to enter a grand minimum, and if so what would be the primary indicators? The ‘goodness’ can be measured by how useful the prediction is. For the purposes of predicting the effects on the Earth of solar activity a 15% error is considered ‘fairly good’ and useful. Our prediction of almost ten years ago seems to be accurate to that precision, so is ‘good enough’. Dr.S is back, brevity is advisable. okay, I know math is hard. I often get the figures confused myself. This year is 2013, plus 5 is 2018. Your link does not project solar activity to 2018. The top panel goes through 2019, so I failed to predict only through 2018…. 28 day cycle clearly visible on slide 4 graphs. Slide 6 also answers old questions about what is the Heliospheric Current Sheet. But what is the tilt angle? Which is 1978 “3D” for those with good imaginations, showing why model makers and B&W photographs were still popular for quickly conveying concepts in print. No way, I am never afraid of embarrassing myself when I seek the truth. Your “top panel” does not extent to 2019. Don’t hide behind numerous links. Just fill in the simple chart for 2018== TSI, plus monitored wavelengths. It’s not that hard, unless you are trying to obfuscate….. Yes, bad tidings from the Sun. We shall have to wait an see. The UAH temps (and all others) begin to show a decline. You do realize to whom you are commenting, don’t you? And you do that to the hilt. Now, seeking the truth is fine, but does require some thought and attention. You can’t empty the well of truth with a leaky bucket [as Eddington once said]. Click on it or look again. 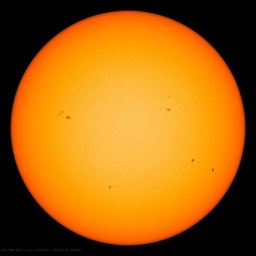 The sunspot number is counted in white light [i.e. all wavelengths]. Tom, he started it, he can finish it, if he is able. I (am most of us) am (are) here to learn. No real scientist appreciates “magicians”. If the established science does not support it, then years of observable, documentable, predictable data must support, or it is dogma. Tom in Florida says : You do realize to whom you are commenting, don’t you? This ridicule statement made me comment here. As anyone can see, the trend could as well be performed with a simple spectrum analysis as would be done to any oscillatory signal. The deviation from the main harmonic of 11 years would be easy to detect, and maybe this is the way the “clever” NASA prediction does ? Sorry Leif buddy, but the link has not changed. If you want to verify yourself, fill in the simple chart for 2018, for monitored wavelengths–High, low, average, will do, Doctor. So if the moderators aren’t checking the “awaiting moderation” queue continuously as they used to, and apparently even less often than they used to check the spam filter, what is the moderation staff doing in this age of whitelisting? Planning a weekend office kegger? Stop embarrassing yourself. The top graph goes through 2020 for crying out loud. That graph IS a legitimate proxy for sunspot prediction through 2018. Enough already. The moderators need to take some of this rubbish off Leif’s back from time to time. It’s becoming unbearable to read and too much like the Alarmists mantra for my blood. Stop the witch hunts please. Your ‘monitored wavelengths’ phrase does not make much sense, so you must be more specific. As almost all solar activity indicators correlate so highly, it doesn’t really matter which one is shown. Recommend a change in eyeballs or monitor; perhaps the Samsung Siii does not have the resolution to see the data-line out to 2019? I was expecting more than the conventional graph. But that was my fault. Hi Leif, appreciating your Research page and your patient answers here. Hoping you will soon update your WSO-Polar-Fields chart, counting down to the polar field flip. The sector structure and its various properties are observed facts [then and now]. What is still not resolved is whether the structure is a cause or an effect. I.e. is there are deep internal long-lived structure or are we over-interpreting surface patterns? You got more than the conventional graph. You got activity separated by cycles [different colors]. what NASA data? I’m on the NASA/NOAA panel predicting solar cycles and I have no idea what you are talking about. Livingston and Penn have the good data. Let’s hope that the rest of the Solar Statisticians will use that data. As soon as “others” produce results as good as theirs, we will rank them as equals. By the way, a statistical model is only valid if the results are continuously up/down, or other repetitive motions. A real model would be based on the underlying physics, and would be verified by statistical results. Bottom line, one can’t build a model from statistics without the complete underlying physical model. By the way, the existing Solar Dynamo model only takes into account the Convective Zone. It treats the Radiative Zone as a “constant”. And the Core as a “point source” non-varying. The place where the “energy” is produced is the Core. Yes, it takes a Photon a 100,000 years to travel to the surface; but, the pressure waves happen 100,000s of times faster. I suppose that explosive pressure wave have nothing to do with energy output /sarc. I would continue, but “Dogma is Dogma” and the latest old, wise ones will need to retire before change occurs. Study the theory of plate tectonics to see how the old, wise ones treat new ideas. 1) obviously, since I linked it to you. 2) But, you cannot predict. 4) Thanks, I will take that advice, certainly….. The point is that we can reasonably well. The point that we are reasonably well, but are too accepting of corruption and perversion, yet few recognize this. Has the predict line changed over the past 3 years or so? If so, I’d like to see that. The prediction of maximum was for 75 [later revised to 72]. That has not changed. Once well within the cycle, the predicted shape is well-determined. Hathaway’s is a good fit to the observations and will, of course, change slightly over time. Does a pore count as sunspot? Any comment concerning the tiny pin prick sunspots? The idiotic hiding of the solar magnetic cycle interruption would be humorous, if there were no climate consequences. Unfortunately it appears we are going to experience a solar magnetic cycle interruption which causes the cooling phase of a Dansgaard-Oeschger cycle or a Heinrich event. I am truly curious how the media will respond to global cooling. As the magnetic field strength of newly formed sunspots decays linearly (See link to Livingston & Penn’s paper below. Seems innocuous does it? Why would an interruption to the solar magnetic cycle make any difference to us? ), the magnetic ropes that rise up from the solar tachocline (tachocline is name for the thin region that separates the solar convection zone and the solar radiative zone) through the convection zone, are being torn apart by turbulence in the convection zone. What is left are tiny sunspots which the specialists call ‘pores’. NSO Kitt Peak McMath-Pierce telescope… ….This trend was seen to continue in observations of the first sunspots of the new solar Cycle 24, and extrapolating a linear fit to this trend would lead to only half the number of spots in Cycle 24 compared to Cycle 23, and imply virtually no sunspots in Cycle 25. The paleoclimatic record shows cycles of warming followed by cooling Dansgaard-Oeschger cycles and the more sever Heinrich events. The D-O cycles have a periodicity of 1450 years plus or minus a discrete change of 500 years (i.e. 950 years, 1450 years, and 1950 years). Roughly every 8000 years to 10,000 years there is a very, very strong D-O cycle which is called a Heinrich event. This is Greenland ice temperature, last 11,000 years determined from ice core analysis, from Richard Alley’s paper. You can see the D-O cycles in this data.The late Gerald Bond has able to track 23 of the D-O cycles/Heinrich events through the current interglacial and into the last glacial phase. This paper provides the observational evidence to support the assertion that the last Heinrich event 12,900 years before present at which time the planet went from interglacial warm to glacial cold when insolation at latitude N65 in June and July was at maximum with 90% of the cooling occurring in less than a decade correlates with an unknown massive change in C14 which correlates with a solar magnetic cycle change. The following is more information concerning how unusual the 20th century period of high solar activity was and what to possibly expect if the sun moves abruptly into a deep minimum. Curiously there are geomagnetic excursions that coincide in time with the abrupt climate change Heinrich events. There are also geomagnetic excursions that correlate with the termination of past interglacial periods. The Gothenburg Magnetic Excursion in a broad sense ranges from 13,750 to 12,350 years BP (William: This is weird. The Gothenburg Magnetic excursion occurred at the same time as Younger Dryas Heinrich event.) and ends with the Gothenburg Magnetic Flip at 12,400−12,350 years BP (= the Fjärås Stadial in southern Scandinavia) with an equatorial VGP position in the central Pacific. The Gothenburg Magnetic Flip is recorded in five closely dated and mutually correlated cores in Sweden. In all five cores, the inclination is completely reversed in the layer representing the Fjärås Stadial dated at 12,400−12,350 years BP. The cores were taken 160 km apart and represent both marine and lacustrine environments. The Gothenburg Magnetic Flip represents the shortest excursion and the most rapid polar change known at present. It is also hitherto the far best-dated paleomagnetic event. The Gothenburg Magnetic Excursion and Flip are proposed as a standard magnetostatigraphic unit. …We present an updated reconstruction of sunspot number over multiple millennia, from 14C data by means of a physics-based model, using an updated model of the evolution of the solar open magnetic flux. A list of grand minima and maxima of solar activity is presented for the Holocene (since 9500 BC) and the statistics of both the length of individual events as well as the waiting time between them are analyzed…. Solanki et al. 2004, Usoskin et al. 2006a). The validity of the model results for the last centennia has been proven by independent data on measurements of 44Ti in stony meteorites (Usoskin et al. 2006b). The reconstruction depends on the knowledge of temporal changes of the geomagnetic dipole field, which must be estimated independently by paleomagnetic methods. Here we compare two solar activity reconstructions, which … …the more recent work of Korte & Constable (2005) may underestimate it. Thus we consider both models as they bound a realistic case. We note that the Yang et al. (2000) data run more than 4000 years longer and give a more conservative estimate of the grand maxima. See figure 3 in this paper. It shows that solar activity in 20th century particularly in the last half of the 20th century was the highest in 12,000 years and more importantly the duration of the high period was the longest in 12,000 years. The cyclic abrupt climate change in the paleo climatic record were caused by an interruption to the solar magnetic cycle. According to the marine records, the Eemian interglacial ended with a rapid cooling event about 110,000 years ago (e.g., Imbrie et al., 1984; Martinson et al., 1987), which also shows up in ice cores and pollen records from across Eurasia. From a relatively high resolution core in the North Atlantic. Adkins et al. (1997) suggested that the final cooling event took less than 400 years, and it might have been much more rapid… …The event at 8200 ka is the most striking sudden cooling event during the Holocene, giving widespread cool, dry conditions lasting perhaps 200 years before a rapid return to climates warmer and generally moister than the present. This event is clearly detectable in the Greenland ice cores, where the cooling seems to have been about half-way as severe as the Younger Dryas-to-Holocene difference (Alley et al., 1997; Mayewski et al., 1997). No detailed assessment of the speed of change involved seems to have been made within the literature (though it should be possible to make such assessments from the ice core record), but the short duration of these events at least suggests changes that took only a few decades or less to occur. Do not push too harder. No body can predict Sun’s behavior accurately—no matter whom admit it or not. sorry, but your own comments speak for ya…. Juvenile? 0nly in your fantasies…. If there is a little more activity at one area of the sun’s surface than on the rest then allowing for Earth’s orbit that would translate to it facing Earth roughly every 28 days assuming that activity is reasonably close to the equator (if it was right on the equator it would be 27 days). This roughly 28 day cycle activity peak occurred at the beginning and end of April so the sunspot count is a little higher that month. It should also be quite high this month as we have got the end of the peak in the first week of May and there should be a new peak later in the month. (Remember April has 30 days). I have been interested in the sun’s absolute magnetic strength. So I use data from the Wilcox Solar Observatory and record the monthly mean average strength from the daily mean average figures (negatives are converted to positives for this exercise). For the first 51 months of cycle 24 compared to the first 51 months of the previous 3 cycles the average strength is 66% of cycle 23, 69% of cycle 22 and 55% of cycle 21. I haven’t adjusted these figures for cycle length because I am not sure that such an adjustment is relevant. Incidentally I have used a similar technique with SOHO EUV data and get these emissions in cycle 23 to be 61% of cycle 23 and with the use of F10.7 cm flux data as a proxy but adjusted to cycle 23/24 data I get EUV emissions in cycle 24 so far to be around 40% for the same period of cycle 22. Has anyone looked at this – perhaps using more sophisticated methodology? Wow, Peter, I think you really said it all. Now if we can make any sense out of what you said…. I enjoy all of the comments here. It has forced me to to improve my mathematical abilities just to keep up with the arguments. Mathematics was never my strong suite, but the issues presented here have forced me to study the things I should have learned long ago! Actually, that is not the case as I have pointed out to you a number of times already. [Sigh]. When we are well into the cycle the past part of the cycle is a good predictor of the rest of the cycle, so Hathaway does the right thing: continuously updating the prediction, based on the latest data. Indeed Hathaway does the right thing by updating the prediction (or is it projection?). What geran and others object to is Hathaway’s erasing of his prior predictions. Most of us are adults and are capable of tracking more than one series at a time. It would be a far better to add to the plot to the past predictions made at Jan-10, Jul-10, Jan-11, Jul-11, Jan-12, Jul-12, Jan-13, in dashed lines grading in weight or in color from blue to red. What geran and others object to is Hathaway’s erasing of his prior predictions. Nobody is keeping track of old weather predictions [except the forecasters themselves in order to improve them] and it is similarly not interesting to keep track of last years solar predictions. Are you a member of the tabanidae? is not homogenous throughout as was once thought. You want a solar interrupt wrap the solar system in a cold heavy H blanket and alter the solar winds escape pattern at its new boundary. Thanks Dr. S. for: Recent results from the Planck mission http://arxiv.org/pdf/1303.5076.pdf Timely too, WPR covered this, then I discovered you had as well on your webpage. Throwing the truth out will make you an “intellectual”…. Here is a link to a similar plot via the webarchive from 9-Feb-2011. The red line from from the April 2013 plot in the header appear to have the very same values as July-2013 to Jan-2019. I don’t see evidence that the curve is updated in the slightest except to erase that portion of the curve that is history. Translation: Nobody does except the people who do. and it is similarly not interesting to keep track of last years solar predictions. Technically speaking, this is known as the Sun’s Period. If solar predictions are comparable to weather predictions they are not true predictions at all. In weather forecasting the outturn is always different in one way or another (sometimes obviously but often subtly) to all prediction attempts that came before. It is that persistent unreliability that causes earlier predictions to be valueless such that they are erased. Solar ‘predictions’ are similarly valueless otherwise they would not be erased as they go along. They are just experimental guesses issued in the hope of making progress rather than in the expectation of success. So I think Leif overstates the case for such guesses having a sufficient level of reliability to be taken as useful predictions. Your comment is not correct. Solar activity in the 20th century particularly in the last half of the 20th century was the highest in 8000 years. That statement is made based on the analysis of cosmogenic isotopes in multiple papers for which I provided links to. Also I believe I understand what causes the D-O cycle and the Heinrich events. Let’s agree to differ. As noted below new observations will determine which assertion is correct. You did not respond to the observation that sunspots are turning into pores. The next stage is no sunspots. Any comments concerning what will happen to the sun in the next couple of years? You have stated that the 20th century warming has not caused by solar magnetic cycle changes. I find that ironic, as we are about to experience the cooling phase of either a Dansgaard-Oeschger cycle or the more sever Heinrich event. Based on the observations I believe a Heinrich event is more likely. I have stated and provided multi links to papers that explain the mechanisms that the majority of the 20th century warming was caused by solar magnetic cycle changes. Observations will determine who is correct. My comments concerning the sun (I have stated that the solar magnetic cycle has been interrupted) will be proven to be correct when there is a NASA announcement that the sun is anomalously spotless. My comments concerning planetary cooling will be proven correct when there are CNN and PBS specials to discuss global cooling. We experienced the warming phase of a Dansgaard-Oeschger cycle in the later part of the 20th century. D-O cycles are caused by solar magnetic cycle changes. The 20th century warming has primarily caused by changes to planetary cloud cover (both low level and high level clouds), not by increases in atmospheric CO2. Easterbrook’s presentation to the US senate committee on Energy, Environment and telecommunications provides data and logic to support that assertion the 20th century warming was not caused by increases in atmospheric CO2. Did you notice that Europe experienced the coldest March in 100 years. Record snowfall and expectionally cold in Europe this winter. Record cold and record snowfall in Alaska. Record snowfall in the US. Increased snowfall on glaciers. Record sea ice in Antarctic. The above seems to be what one would expect if the planet was about to cool. Certainly there is no sign of warming. The double peak is not fiction when, e.g., the first peak is the northern hemisphere cycle max and the second peak is the southern hemisphere cycle max. If you would indulge a question, does this chart describe solar magnetic poles with respect to longitude, that are disjunct from the axial/rotational poles? or is this strictly a depiction of the strength of the magnetic fields? Perhaps you could steer me to some explanatory reading material. Pretty interesting, from 1907 till approx 1914 was a cool local minima (plateau not so unlike our current warm local/ global maxima?). The local minima actually started earlier than 1907 but are we headed for a removal of past century warming? Group of enthusiasts has purchased old Tesla’s labs in New York. Vuk … Dunno about you, that news worries me. People that enthusiastic about Tesla aren’t going to stop at owning his old lab, they’re going to have a go at replicating his experiments … Glad I’m not trying to receive radio in NY! Solar predictions have immense value. Insurance premiums for satellites depend on the predictions. When a decade ago some solar scientists were expecting a very high cycle 24, NASA were making plans for a safe de-orbiting of the Hubble space telescope. Luckily NASA listened to us and based on our prediction of low solar activity decided not to de-orbit the Hubble. Solar activity in the 20th century particularly in the last half of the 20th century was the highest in 8000 years. That statement is made based on the analysis of cosmogenic isotopes in multiple papers for which I provided links to. Also I believe I understand what causes the D-O cycle and the Heinrich events. Let’s agree to differ. As noted below new observations will determine which assertion is correct. New observations [I am just back from a workshop last week discussing this] have already shown that solar activity was not the highest in 8000 or 10000 or 12000 years, so you keep citing old papers is not very useful. Except there might be half a dozen peaks as in cycle 14. Some of those will be in the North and some in the South. It shows the magnetic field near the solar poles. Here is the ‘discovery’ paper http://www.leif.org/research/The%20Strength%20of%20the%20Sun's%20Polar%20Fields.pdf explaining how we measure the field. And here http://www.leif.org/research/Cycle%2024%20Smallest%20100%20years.pdf is a use of that. There is indeed a very strong 1-year period [explained in the links I just gave] having to do with the visibility of the poles changing over the year. We see the North pole best in September and the South pole best in March. The maximum annual sunspot number will either in 2014 or 2015. Next minimum not before ~2021. The cycle is weak and that means long. The cooling starts after the peak and by ~2020 the 30-year trend will be flat. The cycle is weak and that means long. Not always so. 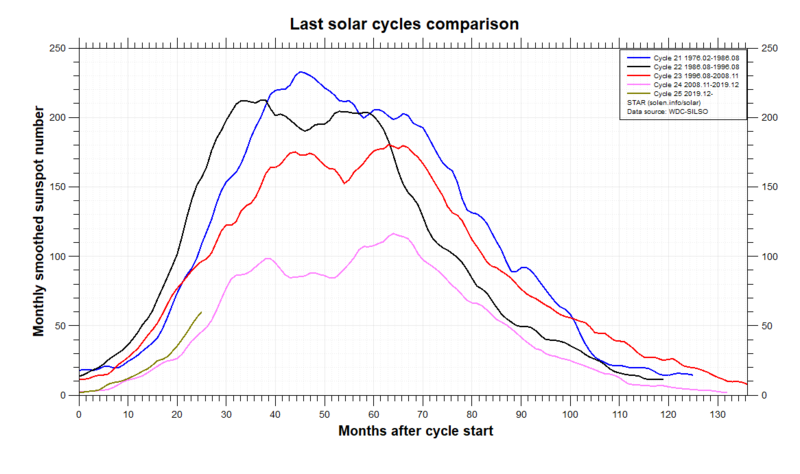 The longest cycle on record http://www.solen.info/solar/cycl4.html was one of the strongest. I thought Hathaway predicted “a big one” for SC24, exceeding SC23. Most would accept a !5% error, but not an error in the order of 100%. Maunder Minimum anyone? Perhaps those Russians are correct. Time to change those models to reflect reality. < Except there might be half a dozen peaks as in cycle 14. Do you mean peaks in the monthly means (of the sunspot numbers) or in the SMOOTHED monthly means? As noted in Penn and Livingston’s paper 2006 paper the magnetic field strength of newly formed sunspots is decaying linearly. Why the magnetic field strength of newly formed sunspots is decaying linearly is not known. There are no observed sunspots on the surface of the sun that have a magnetic field strength of less than 1500 gauss. The sun will reach the 1500 gauss threshold on or before 2017 at which time it will be spotless, no sunspots. It is interesting that the so called ‘skeptics’ have for sometime noted that the 20th century warming pattern cannot be explained by the rise in atmospheric CO2. The 20th century temperature rise occurred before there was any significant rise in atmospheric CO2. The first warming period was then followed by a cooling period during the period when as the largest increase in CO2 forcing (the CO2 forcing is logarithmic which means the first increase has the greatest effect as the mechanism saturates at higher concentration). As most are aware there has been no planetary warming for the last 16 years. Planetary temperature rise does not correlate with atmospheric CO2 levels. There is in the paleoclimatic record cycles of planetary warming followed by cooling which are called Dansgaard-Oeschger (D-O) cycles. The D-O cycles have a periodicity of 950 years, 1450 years, and 1950 years. 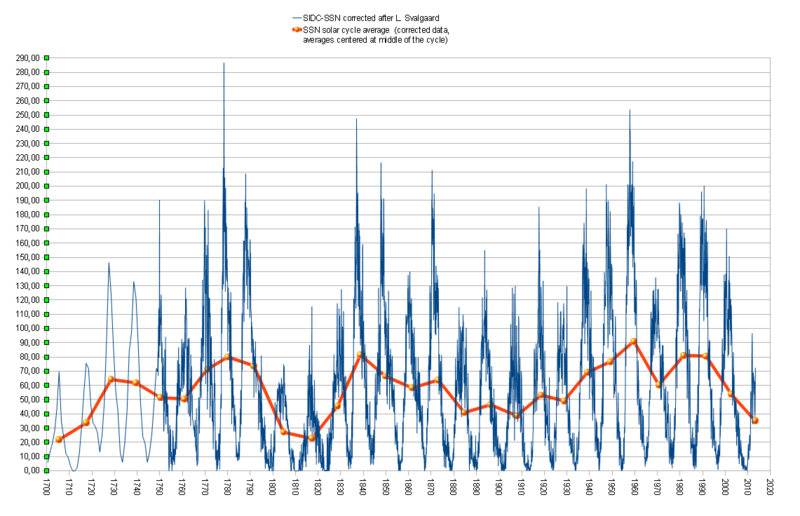 The D-O cycles correlate with solar magnetic cycle changes. This implies that solar magnetic cycle changes in the past caused the planet to warm and then cool. There are series of papers that assert the majority of the 20th century warming was caused by solar magnetic cycle changes, not by rise of CO2 in the atmosphere. If that assertion is correct then 20th century warming was the warming phase of D-O cycle and based on what has happened in the past the sun will know enter into a deep solar magnetic minimum and the planet will cool. As most are aware the planet warms when the solar magnetic cycle is very active and cools when the sun goes into a deep magnetic cycle minimum. There are two types of deep solar magnetic minimum. Maunder minimums where the minimum has a duration of 30 to 90 years and a Sporer type minimums where the minimum is greater than 110 years. Have a look at figure 3 in this paper. There are two different types of grand minima are observed in the paleo record: short (30–90 years) minima of the Maunder type and the long (>110 years) minima of Sporer type, implying that a deterministic behaviour of the dynamo during a grand minimum defines its length. As can be seen in figure 3 of this paper solar magnetic cycle activity in 20th century (based on an analysis of C14) is the highest in 8000 years. In addition the duration of the period of high activity is the highest in 11,000 years. Fig. 3. Sunspot activity SN-L throughout the Holocene (see text)(William: Holocene is the name of the current interglacial) smoothed with a 1-2-2-2-1 filter. Blue and red areas denote grand minima and maxima, respectively. The entire series is spread over two panels for better visibility. William: This graph of Greenland ice sheet temperatures shows the past D-O cycles at which time the planet warmed and then cooled. Antarctic ice sheet temperatures last 450,000 years. Ocean temperatures derived from ocean sediment analysis, last 5 million years. In the same way farmers use weather forecasts to help with crop production and animal management. That type of ‘prediction’ is simply an attempt to skew fate away from the vagaries of pure chance such that even an approximation to the reality can have some commercial value (but often doesn’t). That isn’t really what one means as a ‘prediction’ in scientific terms. He did, see slides 24-26 of http://www.leif.org/research/Predicting%20the%20Solar%20Cycle%20(SORCE%202010).pdf to see where he went wrong. Monthly means. The smoothed means depends on the size of the smoothing window. The standard Wolf-smoothing is not very good [often peaks at local minima]. Meeus-smoothing is better, but still arbitrary. Prediction for commercial reasons is very important for society [which is why solar cycle prediction is so valuable]. Our predictions also serve science by helping to discriminate between competing theories. As we point out in our 2005 prediction paper discussing the Dikpati et al. theory: “The coming cycle 24 has the potential to become a test of their model” [it failed as we all know by now]. So, even solar predictions very much are predictions ‘in scientific terms’. ..Perhaps those Russians are correct.. Chances are they can’t always be wrong. And how about that V. Putin cancelling the end of the world on Dec. 25, 2012? Is that a sense of humor or what? Saving the world like that, lol. Yep,you got it, WordPress doesn’t like closing bracket in web links. Leif, you just dodged the issue. I understand there are numerous little peaks depending mainly on SSN averaging over the cycles. Strangely, you seem to be avoiding discussion of the bigger picture, hemispheric asymmetry. The reference I provided above makes the point clearly, which I noticed years ago in data reporting SSN by hemisphere. In most depictions of cycle 23 for example, there are two broad humps, and each one is very clearly produced by one hemisphere peaking at a different time versus the other. That phenomenon may produce a second peak this cycle as well, but with low overall SSN counts, the “peaks” could be buried in noise. However, the butterfly plot of cycle 24 clearly shows the southern hemisphere lagging the north by about 1 year. Leif, you just dodged the issue. I understand there are numerous little peaks depending mainly on SSN averaging over the cycles. Strangely, you seem to be avoiding discussion of the bigger picture, hemispheric asymmetry. The point is that just looking at the sunspot curve does not tell you which hemisphere a peak ‘belongs’ to. And that even taking the hemisphere into account there can still be more than two peaks. You keep saying the same thing does not make it so. The most recent data [as was discussed in Bern last week] does not support the notion that recent activity was the highest in 10,000 years. Closer to today, the data [both based on cosmic ray data and on a re-assessment of the sunspot number] shows that activity during the 18th century was just as high as in the 20th. Very bold statement given the fact that there exists plenty of literature of the modern grand maximum being in the late 20th century rather that in the 19th century, and there we go in one conference a piece of established science is turned on it´s head. It is fascinating though, is it not? that since the sun went quiet as if on cue we have one severe winter after the next. Of course, it could be pure coinicidence. We can´t resolve this argument on this thread, mother nature will answer this question in due course. Yes there was a solar peak of activity in the late 1700s. It seems that it got just as warm then too until solar activity dropped again giving us a cool trough by the 1880s. 18th rather than 19th, but 19th was also higher than previously thought. But, indeed, some adjustment of ‘established wisdom’ is in order. I am giving y’all a heads-up about what is coming, so you can begin to adjust your thinking already now. There will, of course, be plenty of ‘rear guard’ action to root for the old, obsolete data. Now, people tend to cherry pick what they like and ignore what does not fit there agenda, so, please, be my guest in also doing so. Here you can begin to get a flavor of what is coming: http://www.leif.org/EOS/2009GL038004-Berggren.pdf “Recent 10Be values are low; however, they do not indicate unusually high recent solar activity compared to the last 600 years” and http://www.leif.org/EOS/muscheler05nat_nature04045.pdf “our reconstruction indicates that solar activity around AD 1150 and 1600 and in the late eighteenth century was probably comparable to the recent satellite-based observations. In any case, as noted by Solanki et al., solar activity reconstructions tell us that only a minor fraction of the recent global warming can be explained by the variable Sun”. It appears we only agree on fact the sun is going into a very deep minimum and this will be an ‘interesting’ time for solar physicists. As there will significant planetary cooling, this will also be an ‘interesting’ time for climatologists if they can keep their jobs. I would expect the public will demand a group be held responsible for this fiasco and will demand mass firings of those directly involved in the cover up and manipulation of data. I provided links to peer reviewed papers that provide data to support the assertion that based on an analysis of cosmogenic isotopes – dendrochronological analysis (tree cores), C14 – solar activity in the 20th century was the highest in 8000 years. What new data or analysis overturns the 2004 paper finding “… the level of solar activity during the past 70 years is exceptional, and the previous period of equally high activity occurred more than 8,000 years ago …”? I see the attempt to overturn data that supports the assertion that“… the level of solar activity during the past 70 years is exceptional, and the previous period of equally high activity occurred more than 8,000 years ago …” as a pathetic warmist effort to overturn reality. The science does not support the assertion that the rise in atmospheric CO2 caused the 20th century warming. The 20th century warming happened for a reason. There are cycles of warming and cooling in the paleoclimatic record. All of the past warming and cooling periods happened for a reason. The physical reason was not changes to the levels of greenhouse gas in the atmosphere. Changes to the solar magnetic cycle were the physical driver for past warming and cooling cycles (see paper excerpts and links below). Solar magnetic cycle changes that modulate the amount of low level and high level clouds caused the 20th century warming and caused the past warming and cooling cycles. The sun is heading into a very deep magnetic cycle minimum which will by the mechanisms cause the planet to cool. Low level planetary clouds will increase and high level clouds will decrease both changes cause the planet to cool. The reduction in high level cirrus clouds will cause significant cooling in the Arctic and over the Greenland Ice sheet. The reduction in cirrus clouds has less effect over the Antarctic ice sheet as the very low temperatures (average temperature of -50C) over the Antarctic ice sheet limit the amount of moisture available to even form cirrus clouds. The very cold temperature over the Antarctic ice sheet is due to extreme southern latitude and its elevation (around 15,000 feet). The Antarctic ice sheet has covered almost all of the mountains on that continent. 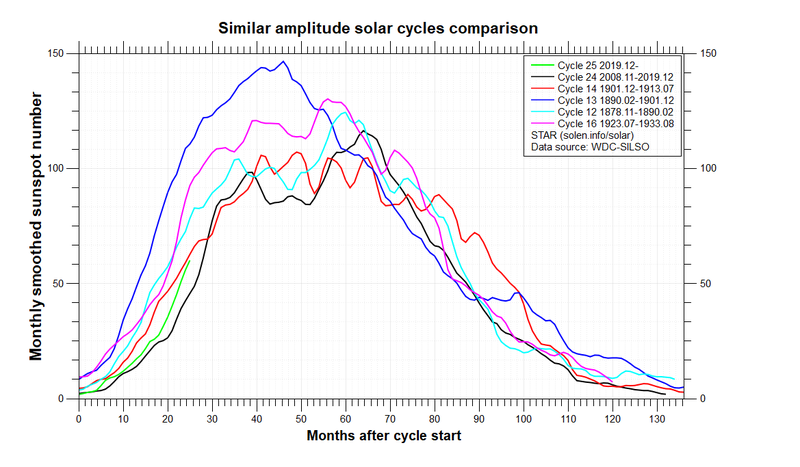 At the above site, the following graph, a comparison of the past solar cycles 21, 22, and 23 to the new cycle 24 is provided. That graph is update every six months or so. This is a graph, that is also located at the above site, that compares solar cycle 24 to the weakest solar magnetic cycles in the last 150 years. Evidence that the 20th century warming (1984 to 2000) was caused by a reduction in low level clouds. All cloud types show a linearly decreasing trend over the study period, with the low-level clouds having the largest trend, equal to −3.9±0.3% in absolute values or −9.9±0.8% per decade in relative terms. Of course, there are still some uncertainties, since the changes in low-level clouds derived from the ISCCP-D2 data, are not necessarily consistent with changes derived from the second Stratospheric Aerosols and Gas Experiment (SAGE II, Wang et al., 2002) and synoptic observations (Norris, 1999). Nevertheless, note that SAGE II tropical clouds refer to uppermost opaque clouds (with vertical optical depth greater than 0.025 at 1.02μm), while the aforementioned synoptic cloud observations are taken over oceans only. The midlevel clouds decreased by 1.4±0.2% in absolute values or by 6.6±0.8% per decade in relative terms, while the high-level ones also decreased by 1.2±0.4% or 3±0.9% per decade in relative terms, i.e. less than low and middle clouds. Thus, the VIS/IR mean tropical (30_ S–30_ N) low-level clouds are found to have undergone the greatest decrease during the period 1984–2000, in agreement with the findings of Chen et al. (2002) and Lin et al. (2004). Evidence that solar magnetic cycle activity in the 20th century was the highest in 8000 years. See figure 3 in this paper, Nature 2004. It shows that solar activity in 20th century particularly in the last half of the 20th century was the highest in 12,000 years and more importantly the duration of the high period was the longest in 12,000 years. When solar activity is high, the extended solar magnetic field sweeps through interplanetary space, thereby more effectively shielding the Earth from cosmic rays and reducing the production of 14C. Low solar activity lets more cosmic rays enter the Earth’s atmosphere, producing more 14C. So the 14C record is a good proxy for the solar radiant output (Bard et al., 1997). … ….However, explaining the observed changes in 14C concentration by production-rate variations alone is too simple an assumption, the more so when rapid 14C concentration changes appear to be coincident with significant changes in climate. However, if we observe sudden, major 14C increases like the ones starting at c. 850 cal. BC and at c. 1600 AD (about 20 per mil), it is hard to imagine any change in the global carbon cycle that can bring about such a drastic fast change, simply because there is no reservoir of carbon with higher 14C concentration available anywhere on Earth. Even a sudden stop of the upwelling of old carbon-containing deep water could not cause the sudden (within decades) 14C concentration increases that are documented in the dendrochronological records. So, if we observe that such a sudden 14C increase, which must be caused by a production increase, is accompanied by indications for a change towards colder or wetter climate, this may indicate that solar forcing of the climate does exist. In theory, increased production of cosmogenic isotopes can also have a cause of cosmic origin such as a nearby supernova (Sonnett et al., 1987). We consider this scenario unlikely, and note here that events such as the 850 cal. BC peak are present in the dendrochronological curve with a periodicity of about 2400 years (Stuiver and Braziunas, 1989; see below). William: The 20th century warming was caused by a change in amount of low level and then high level clouds. The change in planetary cloud cover was caused by solar magnetic cycle changes. Without a very convincing explanation, and their results contradict the sunpot measurements. This needs to be debated more. When you have different sites with contradictory evidence then you can´t really come to any firm conclusion. We need more than they´ve given, Way too flimsy to overturn an establshed scientific viewpoint particularly in view of the fact that it contradicts sunpot measurements and evidence using a similar method but at a different site. I expect more than a sentence. I´m surprised it got published. The most recent data as was discussed in Bern last week does not support the notion that recent activity was the highest in 10,000 years. I hear that workshop was held in the Bern munster, so that any dissent from the unreservedly agreed consensus could be throttled out of existence. The red line is the ‘official’ prediction of the Panel [ http://www.swpc.noaa.gov/SolarCycle/SC24/Oct_2006.html ] and will not change. When did SC24 begin? Jan 2009? That means annual updates should be issued through Jan 2014. Current official curve has the same amplitude as the April 2007 Low view , delayed about a year. By eyeball, The tail looks like an average of the high and low delayed by a year. I don’t understand your answer. When I look to the graph http://www.leif.org/research/ApJ88587.pdf, Figure 7 on the last page, I see a peak around November 1905 in the northern hemisphere and another around January 1908 in the southern hemisphere. I don’t say that the peaks per hemisphere will always be detectable as easy as in SC14 but for me the two peaks in this graph are rather obvious and I don’t see much more maxima. 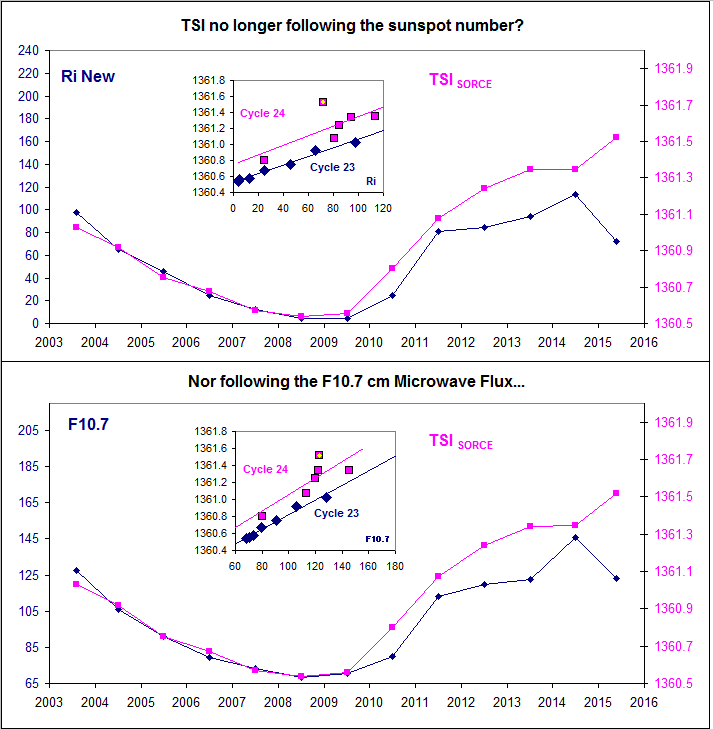 Can I conclude that the TSI must have been about 4% smaller than ever before recorded? If this is true, it could have consequences for the temperature on earth during this period. I have to get back to work, so will leave the discussion where it is. It is also hopeless to argue with people whose mind is already made up. I have given you all my assessment of what is coming. We realize that we are bringing ‘inconvenient truths’ to the table and that even after all the new data is peer-reviewed and published [rather soon] that people will cling to the old stuff for another generation. So be it, their loss. Because we decided back then to go with the low view [which is still too high for my taste] and not issue any further predictions after all. The Hathaway forecast is his own, private one, not ‘official’ in any way, shape, or form. Rectification: The paper “Hemispheric Asymmetries of Solar Photospheric Magnetism” (2013) (http://arxiv.org/pdf/1302.1081.pdf) is not from L. Svalgaard. The authors are Scott W. McIntosh, Robert J. Leamon, Joseph B. Gurman, Jean-Philippe Olive, Jonathan W.
Leif, I appreciate the discussion. Especially the fact you are taking valuable time from your research. Yes, “dodge” was a bit of a bait, since I knew you did work on hemispheric asymmetry. However, oft repeated responses seem to be a dodge. It took a little work to get to some meat, but we got there. I wish we could get there faster, because it be more informative, and maybe more fun for you too. 2010-May-27: (one curve), Peak at 90, Mar-2013. 2010-Oct-09: One red curve, unchanged from May, except May-Oct 2010 erased: Acutal points are all below predicted values. Smoothed actual: 30 @ Dec 2010, Predicted 45. Feb 2011 was just above the red curve at 55. 2011-Oct-15: Smoothed actual 37 @ Feb 2011, Predicted: 52. The blue smoothed actual is crossing the 50 line only about 3 months later than predicted. 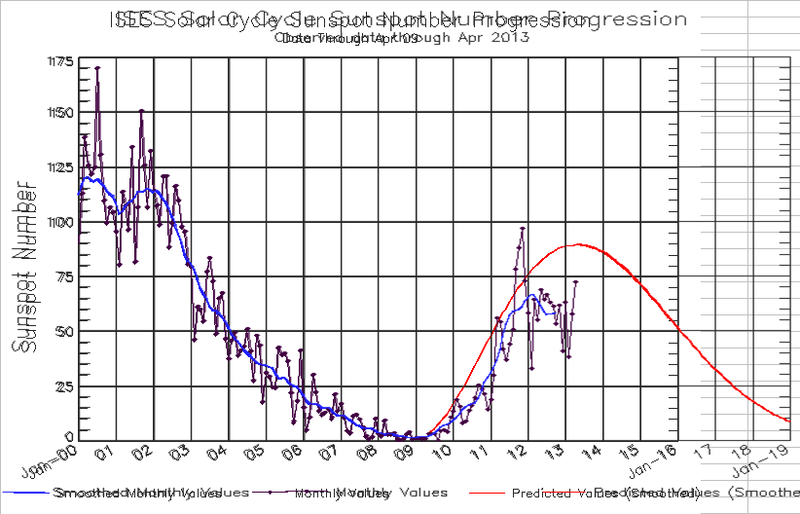 In April 2011, the Smoothed actual was only about 2 below the predicted Thanks to the actual spike in Sept-Nov 2011. 2012-Sep-15: Smooth actual 66 @ Feb 2012, Predicted 79. The blue smoothed actual crosses 65 about 5 months later than predicted. 2012-Oct-17: Smoothed actual 67? @ Mar 2012, predicted 80-81. Last one in the archive. Are you calling it past peak already? I am confirming nothing more than the progressive erasure of the red curve is bloody unnecesssary. They should put it back. Had they not erased it, anyone could see with no effort that up until May 2012 (actual) the red prediction curve as a good fit to the blue smoothd actual curve (as of July. 2011), just 3 to 5 months early. The real divergence happens after May 2012 when 2012 comparitively quiet phase swamps the late 2011 active phase. The red curve is what the prediction was back in 2007. What is of interest is what the prediction is NOW. Remember that there are people who actually use [and need] the updated prediction and couldn’t care less about the red curve. The red curve is of academic interest only. The 2007 prediction was too high to begin with, but it was hard for some people on the panel to swallow the possibility of ‘the smallest cycle in a hundred years’ that I predicted. So science by consensus is not optimal. Now, because of the Livingston & Penn effect the actual sunspot numbers will be too low [compared to a prediction] going forward. The other solar indicators should not decrease as much as the sunspot number. We are already seeing this: F10.7, Calcium plages, Magnetic faculae, number of CMEs, and TSI are all higher than they ‘should be’ for the sunspot number we are seeing. says will cling to the old stuff for another generation. So be it, their loss. William, you might find Dr. S. a bit more cooperative with you if you lighten up a little on the above statement. Sunspot cycle over the period has been between a ceiling and floor. Yes I agree we have had several consecutive nearer the ceiling cycles in the last half of the 20th. Leif would have to agree that indeed they were closer to the ceiling than like.. now on the floor. Hmm what kind of interstellar background might be useful for amplifying the solar cycle? And William, how do they think those burn marks get on the planet. Could several strong CME or Flares do this. If the field doesn’t have time to regenerate between events would that be enough. Is like 3 big pops and were burnt? Indeed, old. He is one of the ‘clingers’. Sorry forgot the link for William. You might want to look at the floor ..
@Leif: The red curve is what the prediction was back in 2007. The webarchive shows the first appearance of the “final” red curve to be May 27, 2010. (See my 1:30pm above) It is different than the previous May 9, 2009. What is of interest is what the prediction is NOW. Yes, but not exclusively. I’m a Bayesian. Revising your estimates based upon new data IS the proper thing to do. . Remember that there are people who actually use [and need] the updated prediction and couldn’t care less about the red curve. The key point is the makers of these graphs are keeping the LEAST interesting part of the red curve and erasing the most interesting. “How good was the prediction up to when??? ?” That’s the part of the red curve they erase. Up to spring 2012, the prediction was good enough, just 3 to 5 months early, not to discount it. You can see the problem in Figure 2 of http://www.leif.org/research/Svalgaard_ISSI_Proposal_Base.pdf where the dashed light-red curve represents the old data and the blue and red curves the new data. The ‘break’ around 1950 is the basis for the notion that activity recently has been the highest ‘ever’. Better cosmic ray data and new sunspot reconstruction show that the old curve is not correct. Our meeting in Bern was precisely to visit that problem and we have succeeded in resolving the problem. But, as I said, it will take some time before the last of the ‘rear-enders’ give up the ghost. I give up. No, it isn’t. I’m on the Panel and know what we do. If there is any difference it is an error in the plotting routine. Revising your estimates based upon new data IS the proper thing to do. . But you also want to know the effective change in the predicted value. No, that is not of interest. What you want is what the current prediction is. The old values are not of any use. Once we are several years into the cycle prediction is easy and a lot less uncertain. The red curve [made before the cycle started] becomes irrelevant. That the red curve was a reasonable fit up through 2011 was a fluke, not a sign of the prediction being any good. The webarchive shows the first appearance of the “final” red curve to be May 27, 2010. (See my 1:30pm above) It is different than the previous May 9, 2009…. It is people like you that waste valuable time for the rest of us by not doing your homework [or ignoring the facts]. Here I compare the May 2009 red line with the April 2013 version http://www.leif.org/research/NOAA-Prediction-Unchanged.png they are identical. So, could we please stop the nonsense. Our users know what they need and want and do not agree with your assessment of what is important to them. Leif! Beer spit on computer screen! “Clingers”???? Too funny!!!! Of these, the 2010-May-27 webarchive red curve is the only one that runs at or above the (Jan-2016, 50) intersection. May 9, 2009 is well below the intersection. A different curve. the May 27, 2010 curve is what matches all later web archives. It matches the overlay you posted at 4:04pm. You say that one of them is from May 2009, but it visably isn’t the May 9 2009 curve and you don’t provide a link to a May 2009 curve you used. If the difference is because of “plotting software”, then calls that I’m not doing my homework are off the mark. Your overlay, with the full history of the prediction superimposed on the actual, is the way it should be plotted. Thanks. I posted this 4 years ago. I believe we’re starting to finally see some noticeable impacts of annualized sub-100, and more importantly, sub-60 count averages. I don’t really update the blog any more, but still believe that post is quite relevant. You say that one of them is from May 2009, but it visably isn’t the May 9 2009 curve and you don’t provide a link to a May 2009 curve you used. Thank you. I missed that one when focusing on the April 2007 plot below it. Yet the webarchive (http://www.swpc.noaa.gov/ftpdir/weekly/sunspot.gif) shows May 6, 2009 (not May 9) with the chart dated April 20, 2009 and high and low curves prior to the key meeting. The May 8, 2009 plot is not in the archive. The next chart in the web archive is not until May 27, 2010, using the red curve from May 8, 2009 which is used from then on. The next chart in the web archive is not until May 27, 2010, using the red curve from May 8, 2009 which is used from then on. None of this really matters, as there is and has always been only ONE low prediction [Rmax=90]. As per NOAA’s policy they don’t change that one EVER. But at this point in time, the old 2009 prediction is not of interest anymore. We are so far into the cycle that one can get a good prediction [as Hathaway does] by just fitting the observations since 2009 to a standard sunspot curve parameterized by Rmax. At this point there is no more any theory involved, just fitting to a known [standard] statistical shape. This method has proven its worth in the past, so that is what is used. When SC24 goes, so goes the solar wind – that’s all I talk about. It looks like the “prediction” (the red curve at the first graph) is quite off the possible development from the so far counted SSN. I wonder why they don’t update the prediction according to the observation. I can’t understand a “policy” so kafkaien that it generates an obviously grossly unreal prediction and keeps it up even after it was falsified by the reality. In 2007 they had high SSN 140 and low SSN 90 peak, and now when it is pretty clear that it will not be over SSN 70, they still keep the 90. It looks like the NOAA solar predictions really do not matter at all, because are clearly outside not just science, but common sense. It looks like the “prediction” (the red curve at the first graph) is quite off the possible development from the so far counted SSN. I wonder why they don’t update the prediction according to the observation. The original prediction before the cycle started was important to alert the users to the strong possibility of a small cycle [at least smaller than the several previous cycles we were used to]. This is enough for planning purposes. Once the cycle gets going, the pre-cycle prediction is not important anymore and the observed run of the cycle is a good enough indicator for the activity to expect. Anybody can extrapolate the data for himself and no theory is required. Hathaway does precisely that. All this makes eminent sense and meets practical needs. The hard-nosed engineers using the predictions are not interested in philosophical deliberations or conspiratorial notions. They want a prediction that is ‘good enough for government work’ and that they have now. So why have policies to keep up falsified solar predictions which are now unimportant and keep to cut from them the past part? Such a policy looks to me absurd. I would like to know, what you think about this animated way to show the sunspot trends (as it is just try what comes out using charts from WFT the long trend would have different slopes after the 1947 with the corrected data). In the uncertain world of solar predictions the one for cycle 24 cannot be said to be falsified. Rather, we must count it as a great success that the actual cycle turns out to be [as predicted] the smallest in a hundred years. If you put some error bars on the curve [ http://solarscience.msfc.nasa.gov/images/ssn_predict_l.gif ] the predication is still within those. As we don’t really know what the future will bring it makes sense to keep the prediction [the red curve] for future activity. It is not helpful for actual use of the prediction to keep it for the past [what use is the weather prediction a week ahead a year ago?]. I take a dim view of wiggle watching. There actually are the error bars on the original NOAA sunspot prediction graph and this is what happens, when I superimpose the original NOAA prediction over the May 6 2013 graph. 1. Only 21 month values out of 53 so far fit into the low error bar (which is moreover obviously wrong – you can’t use sigma this way for SSN scale which has only positive values – because the error bar will come out considerably biased near zero- in fact the error bar should converge to value somewhere between zero and the lowest value at the same X scale point, there are methods how to do this. But in fact this objection is just a minor one, nevertheless if the error bar would be made correctly for the type of distribution then most of even the monthly values would be below it), the rest is below and when we look at the smoothed curve – which is what we should compare with the smoothed prediction – at the first glance (except the low beginning where one would always expect it – especially when we consider the error bar is incorrect) it is at least half of the time below the lower error bar and past the smoothed peak quite considerably. 2. If there’s a policy in NOAA not to change EVER (emphasis yours) the published data then this policy clearly wasn’t observed this time. – the low prediction was shifted several months forward (in May 2009 when it could be quite easily estimated where the smoothed minimum was in 2008 – and one can understand this and one would expect you to do exactly this), the error bars were taken out and the high prediction – which was published almost exactly 11 years into the SC23 and still kept up until May 2009 – was completely wiped out – which one would also understand and expect to be done. So instead of “the smallest in a hundred years” cycle prediction great success, the half of the panel have had still a quite high prediction which even at the moment when it was first published was already not much likely, they kept this next April 2008 too (although already without the error bars you now remind me about) – 12 years to the cycle – and only in may 2009 – half a year into the SC24 they shifted the curve and wiped the high prediction and consented at SSN 90 peak – which likely is still 35% higher than what actually happens. I don’t blame anybody for anything, but to talk about policies and claim a “great success” looks rather more like an expression of loyalty to your field colleagues then a sober evaluation of the NOAA panel predictive capabilities based rather on consensus than prevalence of a major comprehensive theory. -Even the group which estimated the low cycle clearly still overestimated it considerably and only future will tell how much exactly. It was not NOAA SWPC (nor NASA) who made the really weak cycle prediction. I follow this issue at least long enough to know that it were other people than NOAA panel who actually used the known theory and relatively long time ago forewarned that the solar cycles following the SC23 very likely could be even considerably weaker. 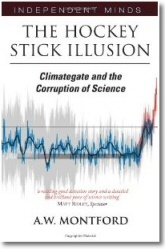 It were other people who warned that the sun – directly or indirectly, influenced by the planets or not, wobbling around barycenter or not, whatever theory one prefers… – is chief climate driver and therefore weak cycles could change the global temperature trends (and the Biesecker2008 admits “Lower TSI (if confirmed) implies a new natural cooling for climate change”) – which likely already again happened – although you maybe have hard time to see the solar signal in the temperature anomaly data in the 2nd half of the 20th century, others seem to see it quite distinct – and especially in the 2nd half of the 20th century, because there’s less noise in the data – and they see also the fact that the solar trends in the last half of the century in vectors agree with the temperature anomaly trends and that contrary to the common belief the solar trends since the beginning of the last warming period starting at the point coinciding with the end of the SC19 in 1960’s (-not in mid 1970’s as many repeat over and over even here without actually looking into the temperature anomaly data with the solar signal smoothed out – when you look at the graph please mind the clear precedence of the SST turning point in ~1957, especially when you come to the note below the line) also rised up until 2000’s and since then steeply descend and we are just years from the turning point where all the 20th century solar activity upward trend will level – see the animated trend graph (the main purpose of the wiggle watching is to realize, that it is not the solar cycle smoothed peak where the solar cycle influence peaks, but it is typically 2-3 years after the smoothed official peak due to asymetricity and cummulativity of the solar cycle signal, the same for the minima – for example the SC19 smoothed peak was in March 1958, yet the maximum SSN trend was in November 1960 – so if you ever want to do a SSN/surface temperature correlation, you must shift the two accordingly, otherwise your results will not show their real dependence, because you will cancel a big chunk of it in the process, other purpose of the graph is to show, that the sunspot activity generaly during the last warming period rised up until 2000’s, where it eventually leveled – as the global temperature anomaly did – and began a steep descent into a Dalton minimum levels)- due to the very weak SC24 (resembling much more SC5 than SC14 – especially when we use the SSN correction made after your suggestions and use simple extrapolation which gives SC24 SSN average around 30, which is quite closer value to the SC5 SSN average than to the SC14 average). …and obviously could wreak havoc in the long -both on scientific and political level- pushed CAGW agenda, which in my opinion IS a political conspiracy at very least against common sense, because major environmental threat were always the cold periods, not the warm ones. This is obvious even to layman like me (when it comes to solar physics and climatology). To keep up the unreal “low prediction smoothed” from the pair of the original two (when the observation – which already as you point out well could serve to predict the rest of the cycle – experienced even considerably lower activity) I find being a confusion of both the policymakers and public. In fact especially the SC24 even now just ~4.5 years to the cycle is so low, that no way there could be any significant warming next decade if the solar factor is the chief driver (as common sense would expect*) and in such case if the longer solar periodicity as in the past is still in place, then next half of the century. To take this possible predictions seriously and direct the resources in acquiring better understanding of them is absolutely decisive for wide range of local and global issues not just US govt.. Even the shorterm prediction of further decline of the solar activity trend in the next decade, which seems almost sure now from so far observed SSN values in the SC24, could mean the great fiasco of the CAGW agenda and should lead to immediate scraping of all the carbon mitigation policies, because even if there’s a significant CO2 factor (which I think practically isn’t, because of the logarithmic nature of the CO2 forcing and hardly enough fossil fuels available to double its content in the atmosphere in the future from today’s values especially when one considers natural CO2 sequestration rate) the solar activity changes are so profound that the weak sun is already very likely overruling it (if it indeed ever dominated) and the CO2/temperature anomaly correlation completely breaks up, most probably because it is too weak. *I think there first must be a short-wave from sun and something to warm it up with (which in our case chiefly is the ocean water because it covers more than 2/3 of the Earth surface, especially in the areas between polar circles where the insolation is relatively high and because it is quite very transparent to 300-700nm shortwave of the solar spectra throughout its upper epipelagic layer, which has orders of magnitude higher heat capacity than whole the atmosphere, not speaking about lower troposphere or even the CO2 content in it) and then there could be a re-radiated long-wave which with the CO2 and other GHG can make a GHE in the atmosphere and even that, for obvious reasons would be modulated by the solar activity – directly (less TSI->less heat->less long-wave heat->less GHE) and indirectly (i.a. the “soda effect”: less TSI->less heat in the ocean->lower temperature of the ocean->higher CO2solubility in its water->less CO2 in the atmosphere->less GHE) – but it is also good to note the long-wave mid-IR band in question resulting from the atmosphere black-body temperature has no significant potential to rewarm the ocean, because the water is very opaque (at order millions of times more than for the solar short-wave spectrum including UVA) for it and therefore the IR cannot significantly penetrate it deeper than just like some hundredths of millimeter. What warms the ocean is chiefly the shortwave directly from sun coming mainly in visible, near-IR and UVA spectra in which the fluctuations cause the fluctuations of the sea epipelagic layer warming or cooling. The relatively thin epipelagic layer has way much more heat capacity than whole the atmosphere and stores the bulk of the direct shortwave radiation energy from the sun converting it to heat (and that’s what keeps the surface air temperature within moderate boundaries suitable for life, without it the temperatures would have much wilder fluctuations which we see on deserts). Moreover the ocean surface temperature is in average considerably higher than the average surface air temperature and therefore the air can’t generally cause ocean warming by conduction due to the 2nd law of thermodynamics. 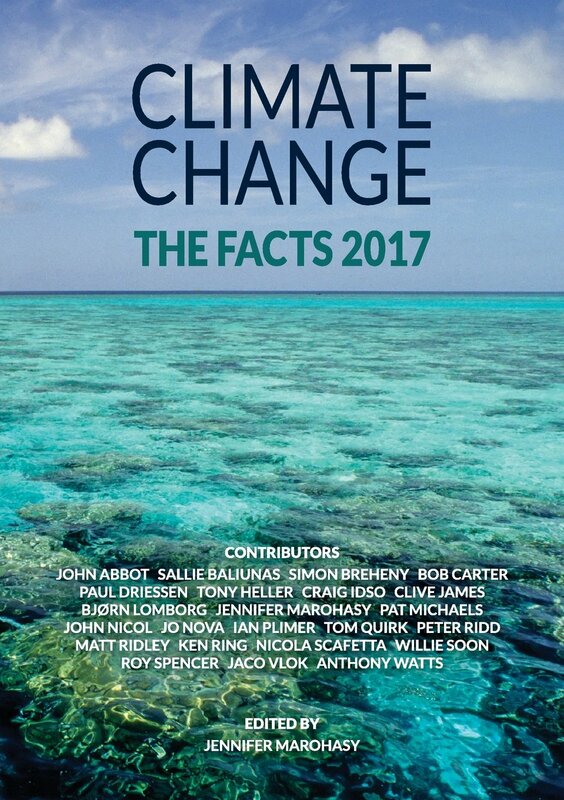 In short the GHG nor its effect on the atmosphere temperature can significantly warm the ocean and that’s the fatal flaw of the CAGW GHE theory claiming the CO2 being the chief factor of the recent warming – it is physically utterly impossible – If there’s a warming of the ocean – as the SST and OHC data suggest – it must be a result of other factor than GHE – and it is quite obvious that first factor to check is the solar activity fluctuations and their direct and indirect effects. and only in may 2009 – half a year into the SC24 they shifted the curve and wiped the high prediction and consented at SSN 90 peak – which likely is still 35% higher than what actually happens. I was actually on the Panel and I can tell you a bit about the history. Initially, most members were impressed by the Dikpati et al. prediction and argued for a high value [185 or so] [by the way I was a referee of their paper http://www.leif.org/research/Dikpati%20Referee%20Report.pdf ]. Myself and Pesnell argued that the weak polar fields indicated a much weaker cycle [ http://www.leif.org/research/Cycle%2024%20Smallest%20100%20years.pdf and http://www.leif.org/research/Schatten-2003-prediction.png ], about Rmax 75 [later reduced to 72], which would make it the ‘smallest in a 100 years’]. During our deliberations we slowly convinced the rest of the panel [with one or two exceptions] that a high prediction was not tenable. Unfortunately, the panel did not have the courage to go all the way to 72 and settled for 90. I admit that not going all the way down to 72 was not based on science, but on political pressure. But that we managed to cut the alarming high prediction in half using sound science I consider to be a great success. The percentage error is not important when values are small. If we predicted 5 and it came out 10 [a 100% error] this is of no consequence at all. What is important is how much lower than the worst-case maximum we predict. And then going down from 185 to 90 or to 67 is only a difference of 13%, pretty good I would say. The value 72 is based on a solid theory, e.g. http://www.leif.org/EOS/Choudhuri-forecast.pdf The 90 is a fluke that should not be taken as a measure of the theory, but as a weakness of doing science by consensus. But not based on any [valid] physical theory why cycles should be weaker. is just speculation and wiggle matching. Now as Schatten pointed out 10 years ago we may be headed into a Maunder Minimum [ http://www.leif.org/research/SSN/Svalgaard12.pdf ] which will be a blow to alarmists who think we’ll freeze to death [when we don’t]. The observed sunspot numbers are too low compared to the prediction, but that is probably due to the Livingston & Penn effect. TSI and the CME rate have not fallen below the prediction [ http://www.leif.org/research/TSI-not-following-SSN-F107.png ] and if the sun has any effect those variables may be what count. I agree that one should take our prediction seriously and would welcome resources directed our way. Sorry, here’s the link I hope it works now.for you. It did, but as I said, when we decided to go with the low prediction we also decided to shift it over. This is in keeping with our promise to update the prediction if warranted. Thank you for telling more about the history of the NOAA prediction. I was aware that there were panelists, who actually wanted lower prediction than the 90 and I regretted they didn’t prevail, because I think there is a sound theory which supported it long ago, but I didn’t know the details. Yeah, for you personally it is in my opinion a great success to push it down at least to the 90. But I think that for NOAA panel and the political pressures behind it is a failure. speculation and wiggle matching. Now as Schatten pointed out 10 years ago we may be headed into a Maunder Minimum [ http://www.leif.org/research/SSN/Svalgaard12.pdf ] which will be a blow to alarmists who think we’ll freeze to death [when we don’t]. I checked the OLS trends thoroughly and it really looks like the power center of the cumulative sunspot activity is 2-3 years after peaks. For apparently not so obvious reasons, which are nevertheless basic mathematics of the asymetric cyclical signals and are far from any speculation. The cumulative SSN center-points for minima and maxima where the steepest slope trends point are in time simply elsewhere than the smoothed peak, that’s not a speculation it is a fact which can be exactly quantified. The wiggle graph was just a way to show it. I don’t think it is much speculation 4.5 year into the cycle that the SC24 will have SSN average around 30 (- which would be already comparable to SC5 if we use your SSN correction) either. I of course don’t think we will freeze to death even if the solar activity goes to Maunder minimum no sunspot level and the global temperature anomaly will follow – it will just a bit shift the usual climatic bands towards the equator. Nothing catastrophic, people can adapt to it. Only the CAGW alarmists would get an infamy in the history of science. The observed sunspot numbers are too low compared to the prediction, but that is probably due to the Livingston & Penn effect. TSI and the CME rate have not fallen below the prediction and if the sun has any effect those variables may be what count. I seriously think that a good, on sound theory based predictions of the solar activity, made by well funded and politically unbiased scientists and institutions is an essential thing for climatology to give meaningful results. Unfortunately we live in real world, where the political agendas often prevail the common sense and the solar scientists, especially the unbiased were fifth wheel in the IPCC and whole the over-funded CAGW hype. I have friend in ORNL, who told me that the AGW issue first was intended to push needed energetics policies changes towards greater use of nuclear energy (especially the 4th generation) where the development more or less stopped after TMI accident and huge propaganda around it, but then it was taken over by environmentalists, sometimes the same people who pushed the antinuclear policies and whole the thing went awry towards the bio-fuels and windmills or large solar plants which I think are real man-made environmental and economical disasters which moreover due to lack of energy this produce and huge resources they consume, while blocking really sustainable solutions lead to another disasters “by reaction” as the fracking. In my opinion we haven’t time for scams and charades like the CAGW, the point where there will be not enough fossil resources for energetics to keep this technological civilization running is approaching fast. I counted the proven reserves and estimated the consumption and it looks to me quite scary, much much scarier than when somebody, who apparently seriously believes that there can be a Venus-like GHE runout on Earth up to boiling oceans somewhere in foreseeable future, tells me there might be one degrees or two more after 100 years. So I think the mankind maybe more than ever before needs people like you, especially in the times when other want people pay for phantom catastrophes (the inept or sinister activists and politicians and their agendas preferred over facts). This is in keeping with our promise to update the prediction if warranted. Yeah I think it is right think to do, but I would think, that the further data just corresponding with the prediction peak is a boldwritten warrant for further update. As the continuous update that Hathaway does is just extrapolation and curve fitting without theory [which does has its place and works statistically] and the red curve is real prediction based on sound physics [although a bit too high – because of politics] perhaps the best is the combination that you see on NOAA’s graph. There you have both worlds and can judge for yourself. At any rate, that is NOAA’s policy [whether one disagrees or not – I can’t do anything about it].